Effective collaboration with constructive give and take. Client insights into their own businesses and markets are prized pieces of the puzzle when creating high-return campaigns. Likewise, our insights into marketing techniques and trends are necessary to complete the picture. It takes both perspectives. Respect for each other’s unique skills and knowledge. Good partners have complementary talents and mutual admiration. Open exchange of ideas and concerns. It is important that strong opinions not go unexpressed. Healthy exchange is the cornerstone of creative conversation. Support for each other’s success. 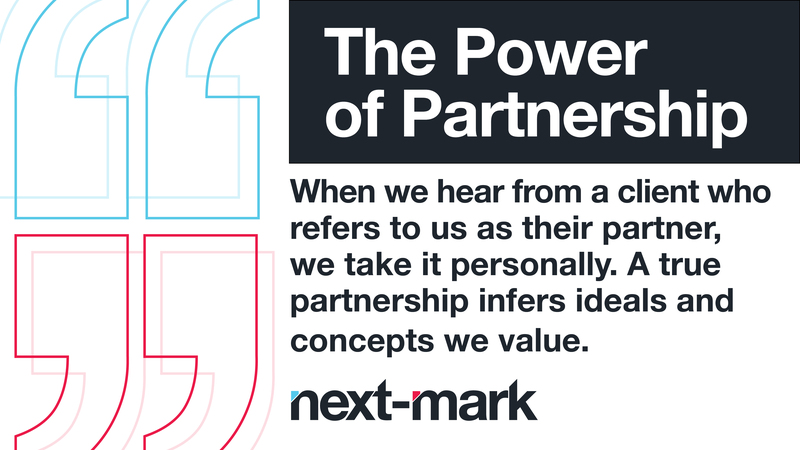 True partnerships are a bond that buoys each participant to be better. Help through challenges. Problem-solving is a team sport, and effective partnerships are a catalyst for resolution. Reliability and trust. Knowing you can depend on your partner to come through reduces anxiety and enables you to concentrate on your own duties and workload. Responsible use of resources and respect for each other’s time. The best partnerships stand firmly on integrity and consideration. Shared passion and commitment to achieving goals. Excitement and dedication fuel mutual success. Being each other’s champion. Everybody needs a steadfast friend – and cheerleader. Truth in all things. Partnerships require honesty. It’s critical that all participants work with the truth – and the same truth – for any endeavor to be successful. Most importantly for us is being the type of partner the individual client needs, working to create the specific relationship that brings the most value to them. There’s a lot involved, but also a lot to gain in building a lasting partnership.